The latest stage of the saga of the Victoria Park section of the Filwood Quietway draws to a close. New proposals have been made as part of the Cycling Ambition Fund programme for the Filwood Quietway after the withdrawal of the previous properly ambitious and well balanced proposals in January 2017, after a vitriolic anti-cycling campaign playing on fear. Replacement of existing A-frame barriers with K-frame barriers. 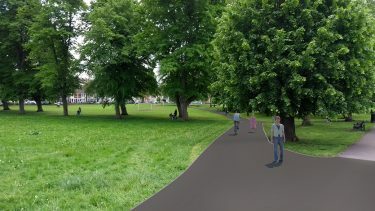 The Campaign considers that the proposed development of a wider path with cycling permission in Victoria Park creates neither noticeable benefits nor problems for cycling. Consequently we neither oppose nor support the development, but are disappointed that an opportunity to improve cross town cycling has been lost, in particular that there is no useful contribution to the Filwood Quietway cycle route by creating a more direct route on adjacent streets. Our general view is that the Filwood Quietway is a disappointment and a lost opportunity. The development may be beneficial for strictly local purposes but whether it has sufficient relevance to cycling to make a claim on the Cycling Ambition Fund or any other cycling infrastructure budgets is a matter on which we do not comment. As is to be expected from such bland plans, there has been a much lower response to the consultation than previously. In January over 1,000 responses were recorded, with 56% objections and 44% in support. This consultation has received 97 responses taking a position with 50% objecting, 44% in support, and 5% neutral. So much has been compromised and sadly too little will be achieved as a result. I feel that concerns about cycling speeds/motorbikes/bats have been overstated by people who have an avenue to make their views heard most loudly. If there was an option at this stage to allow these scarce resources to go to a more a more ambitious project, even outside of our city, I would say do that instead. In the absence of that as an option, I support this on a “something is better than nothing basis”, but dearly wishing there was more courage to do what is right for the future of the city and its more vulnerable (i.e. our children) not just to compromise for those who have a voice to shout the loudest. 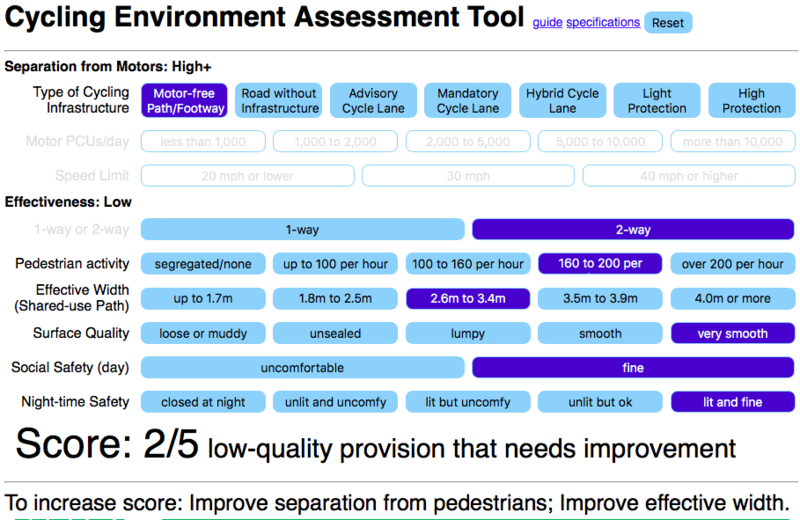 The revised proposal scores 2 out of 5 using the Cycling Environment Assessment Tool which is ‘low-quality provision that needs improvement’. The original proposals scored 4/5.